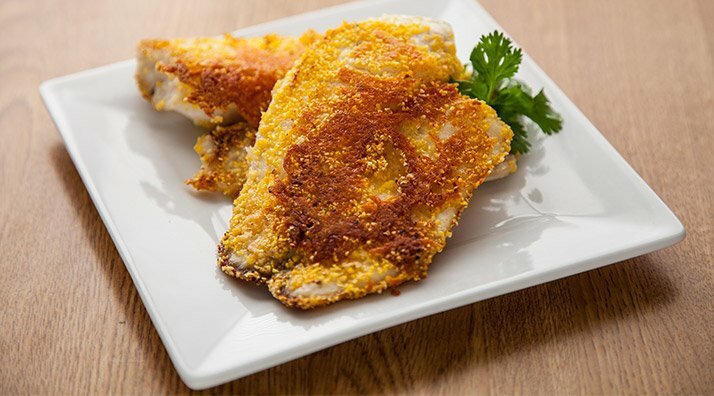 Even the kids will enjoy this healthy, flavorful tilapia recipe. Make it for dinner tonight! Tilapia is a great choice for protein, especially if you're getting a little tired of chicken. The crunchy texture of the crust pairs well with the light, delicate meat of the fish. Place fish on a plate and drizzle with milk. In a separate bowl, mix parmesan, cornmeal, salt and pepper, and Montreal spice. Dredge the fish in the dry rub. Coat both sides well. Over medium heat, place olive oil in nonstick pan and cook fish for 5 minutes on each side, or until a golden crust forms and fish is cooked through.